Choose the products you need to create a natural bedroom and a pure, safe, sleeping environment—for every member of the family. Here you'll find organic mattresses and bedding, adjustable bases, safe and durable crib mattresses—even organic pet beds! 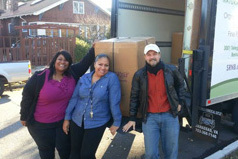 Need furniture, too? Savvy Rest offers a wide range of beautiful platform beds made with sustainably-harvested woods. Customized just for you. Choose 2, 3, or 4 layers of natural latex. Elegant style with organic and natural materials. Savvy Rest offers beautifully-made natural platform beds to suit any décor. Toppers are ideal for creating a comforting, pressure-relieving surface. We offer three styles. The Savvy Baby™ will not expose your baby to toxic flame retardants or pesticides. 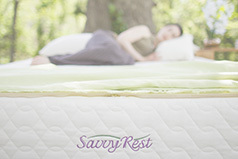 Savvy Rest offers a complete line of organic and natural bedding. 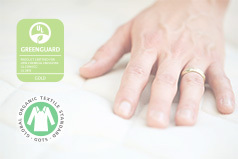 Choose organic sheets, mattress pads or allergy covers. The perfect customizable sleep accessory. Choose from four natural fills. Choose from seven styles of Savvy Rest organic pillows to complete your natural bed. Strong and durable, our matching foundations replace the box spring in any bed frame to support your latex mattress. Adjustable support for your organic mattress. Our organic and natural furniture items are available for purchase online or at one of our four Savvy Rest Natural Bedroom locations. Create the perfect platform bed or organic sofa for your home. Order complete swatches of our zero-VOC finishes and organic fabrics here.